Are you a quilt-maker? I am not. I did try my hand at latch-hook rugs for a season, and also did some cross stitching. Other than that, I have never really enjoyed sewing or knitting, or anything like that. But, I do know how much time and work goes into these things, and I admire those who take the time to do it. The finished products are beautiful works of art, and it seems that most quilts usually have a story that comes with them. They are family heirlooms that can be passed down to the next generation. "While individual worship and spiritual growth can help grow your relationship with the Lord, it is through community that we receive support and encouragement. Throughout Scripture we are encouraged to gather in His name, not only for worship, but for the strength to be had in uplifting and praying for each other." CONTEST OFFER! 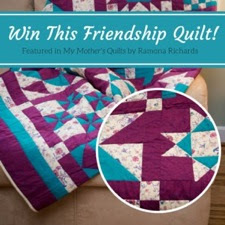 You can WIN one of the quilts featured in #MyMothersQuilts by Ramona Richards. Also up for grabs: loads of other prizes including quilting hand warmers, coloring books, and 25 signed copies of Ramona’s book. Enter now! Winners will be emailed after the contest ends on June 30, 2016. Click the image below to get started! ABOUT THE AUTHOR: Ramona Richards is an award-winning editor, speaker, author of nine books, and a frequent contributor to devotional collections. An avid live music fan, Ramona loves Nashville, which she’s called home since she was ten. Sensing her mother was near the end of her life, Ramona documented her mother’s stories and lessons behind each family quilt. These stories form the devotions in My Mother’s Quilts. Find out more about Ramona and her books by visiting her online at ramonarichards.com.